The third stop on this tour of the Northern Cemetery in the City of the Dead is the mosque of sultan Qaytbay. You will find this one about 600 yards southwest of our previous stop. Put "30.0441730, 31.2750830" into your Google search bar to find it on the map. I'll point out all three of these stops with red arrows on this map. 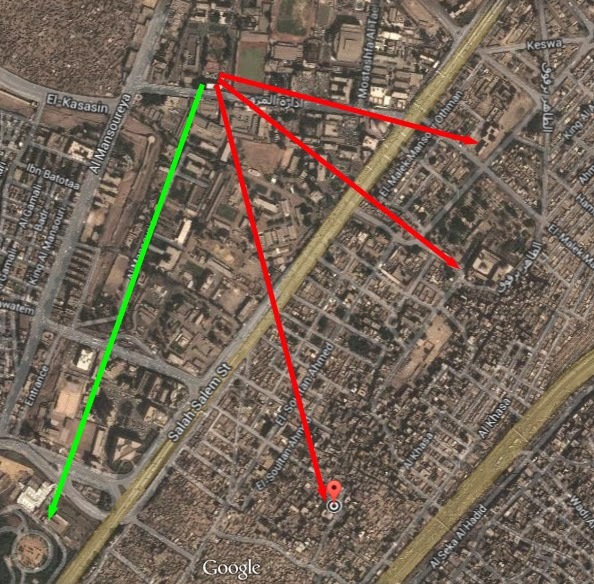 The green arrow points to the popular tourist stop, Al Azhar Park. Most of the photos of this mosque feature the domes and the minaret on the exterior, but the best features are found inside. It is a tiny mosque compared to most of the "tourist mosques." Let's start by taking a look at the main ceiling. The tiny interior has a number of niches, ceilings, lights and windows. Leave time to explore the interior and maybe sit for a while. The stained glass was a bit of a surprise. It matches up well with what we saw in Coptic Cairo. If the pictures in these three posts have aroused your curiosity about the Mamluks and their roles as leaders in Egypt, you can find all of the details in tidy academic form in chapter 8 of Volume 2 of The New Cambridge History of Islam. You can read it online at that link (about 40 pages beginning at page 237) or download the whole volume as a PDF file for your computer, tablet or Kindle. Just a couple of hundred yards due south of Qurqumas you will find the Mausoleum complex associated with Sultan Faraj ibn Barquq. This link will take you to a "live" Google map that shows the area. 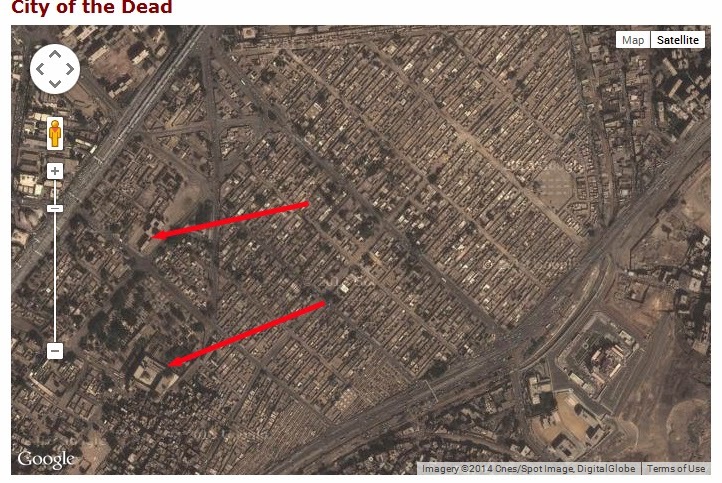 I highlighted the two buildings with red arrows. You may notice that a street junction in the form of an "X" marks the spot near the flyover bridge on Salah Salem. This is a large active mosque. The street along the minaret side is tree-lined. The interior courtyard also displays a number of trees, which is quite a contrast to any other mosque that we have seen. The carpets at the front are worth pausing for a close look. This is probably one of the most photogenic mosques you will find other than Ibn Tulun. 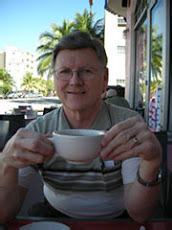 While shopping at the supermarket in our neighborhood I spied cans of sweetened condensed milk on the top shelf. I immediately thought of a fantastically good recipe for Key lime pie that my good friend, Anna of Richfield, MN, has shared with me. I bought two cans of the milk and emailed Anna for the recipe. I've always thought the Egyptian lemons had a limey taste so I decided to use the Key lime pie recipe to make an Egyptian Lemon Pie. Egyptian lemons are much smaller than typical U,S. lemons, more like the size of a Key lime. They also produce more juice for their size than U.S. lemons. I only squeezed 10 of these small lemons to make 3/4 cup of juice. I had brought some graham crackers thinking that I would use them to make a cheesecake but a lemon pie sounded more appealing and something that was not familiar to Egyptians. The recipe not only tastes good but takes very few ingredients and is so easy to make. The first pie I made was a trial to make sure it would turn out, not that I haven't made the recipe successfully many times in Bloomington. Keep in mind that I have a somewhat temperamental oven here in Egypt. The first pie was a success but it didn't taste as limey as the lemonade we dearly love here. I made another and gave it to my neighbor. After a couple days I asked how they liked the pie. The 16 year old daughter screwed up her face like she was sucking on a lemon and asked if I had used any sugar in it. Only two cans of sweetened condensed milk-that's plenty of sugar! The adults in the family gave the pie an enthusiastic thumbs up. Another pie was made and given to another family as thanks for a tasty rabbit and pigeon meal. They also declared the pie to be good.